Is it my birthday? No, that was in January before I had a blog, but I woke up that morning to find a flock of flamingos on my front lawn. 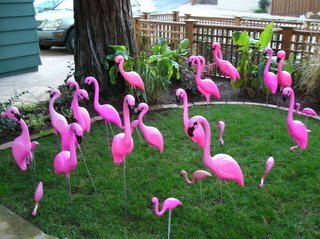 The flocking was a birthday greeting from a friend [who will remain anonymous so all of his other friends don't get jealous]. The Los Gatos High School Marching Band will deliver and set up this colorful display in the stealth of night, and then quietly take them away 48 hours later. It's a great way to celebrate a special occasion [like Valentine's Day which is probably why this is on my mind] and support a worthy community group.